September 13, 2013 /1 Comment/in Craft Ideas, Foam Crafts /by Craft Supplies for Less, Inc.
Before you make your next Halloween Costume with Craft Foam, read this post! We have discovered that you can spray paint Craft Foam (sheets & rolls) to make whatever color you need for your costume or craft project. Make craft foam sparkle with Metallic Gold, Metallic Silver, or create a color match for whatever you are making easily with Spray Paint. This is super helpful considering large Craft Foam Rolls are only available in a few limited colors! Customer’s looking for additional colors of foam craft rolls have inspired this blog post! Just this week we have been asked about the limited colors we offer in craft foam rolls. One customer looking for yellow to make a Minion and one for brown to make gingerbread men. Follow these simple instructions and you will still be able to bend, cut, stitch, fold, and create with the spray painted craft foam! No paint cracks, streaks, or lines either! The foam remains just as flexible as it was before it was painted. We didn’t believe it until we tried it (see below). What began as an experiment ended with terrific results…purple craft foam with all the flexibility of the unpainted gray foam we started with! 1) Start by making sure you have proper ventilation for the spray paint fumes. Next, cover your work surface with a broken down cardboard box, an old vinyl tablecloth, or plenty of newspaper. For demo purposes, we used a gray 9×12″ foam sheet. However, the craft rolls (used for making costumes) can be painted too! 2) The test below was done with Krylon Indoor/Outdoor “Metal, Wood, Wicker, & More” Spray Paint. Whatever brand you choose, make sure to follow the instructions on the spray paint bottle and remember to shake the can before spraying! Here is what the foam looks like after we applied a thin 1st coat. The spray paint on the foam was dry in less than 10 mins! 3) And now for the 2nd coat! Don’t worry if the foam curls a little on the ends or sides when the spray paint is wet. We noticed this too! However, it will flattened out once the paint dries. Even after the 2nd coat, the foam sheet was dry within 10 minutes. 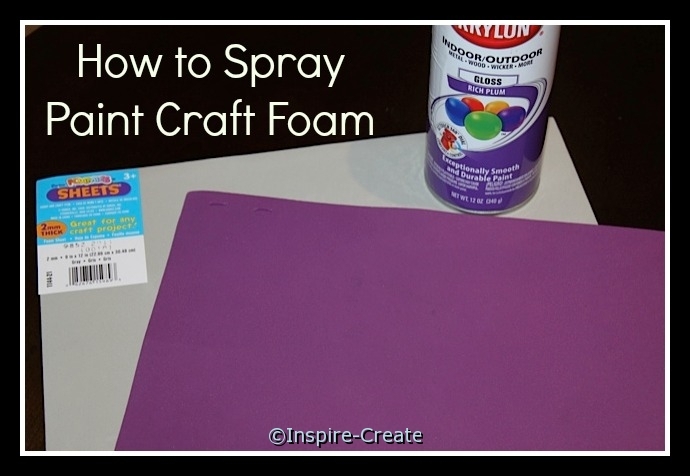 Once it’s dry you can bend, fold, cut, and stitch the foam without cracking the paint color! The craft foam even has the same texture and feel. It is also just as flexible as it was before it was painted! Folded from front to back. Notice the color is only on the front side of the foam! Now its time to get busy on all those creative ideas you have for Halloween this year! Click Here to see how we made “Olympic Medals” with Metallic Spray Paint and Craft Foam! Click Here to see what we did with Electrical Tape, Spray Paint, and Craft Foam! Buy Craft Foam for Less HERE… Click Here to Save on Craft Foam, Shapes, Sheets, & More! Please share your thoughts, feedback, ideas, &/or creations by commenting below or posting a picture on our facebook page!